by showing an encyclopedia entry of Count Basie’s life, playing a Youtube clip of his playing and singing, and reading aloud a poem about Count Basie. by letting students explore several literature-based MGRPs online, which I have preselected. Students get into small groups and brainstorm and pitch their MGRP concept/idea to each other. SOL 8.5 The student will read and analyze a variety of fictional texts, narrative nonfiction, and poetry. SOL 8.6 The student will read, comprehend, and analyze a variety of nonfiction texts. b) Summarize the text identifying the supporting details. SOL 8.7 The student will write in a variety of forms, including narration, exposition, persuasion, and informational. I will pass out two handouts and whiteboards. 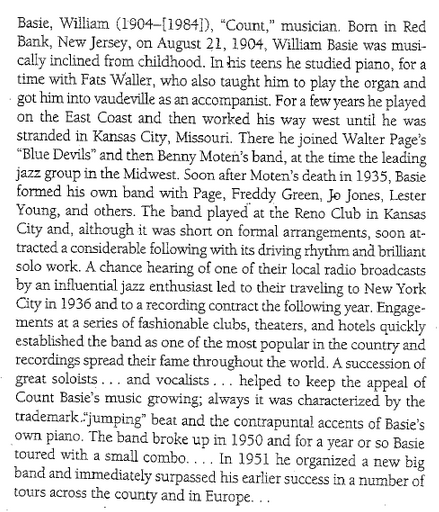 One is Count Basie’s bio taken from an encyclopedia. The other is a poem titled “Basic Basie” by Kamau Braithwaite. I will ask students to silently read the bio. On their whiteboard, I will ask them to summarize what information they get from the bio. I will read aloud the poem, “Basic Basie.” I will ask students to write on their whiteboards what emotions they felt as the poem was read. Next I will ask them to share their reactions to the bio and poem with their shoulder partners and also hear from the entire class what they discovered. I will ask students to grab networks and open up the Multi Genre Research Paper (MGRP) Instructions in Google Classroom. Once opened, they will click on the link that leads to a literature-based multi genre research paper of Dracula. I will give the students 20 minutes to peruse that paper as well as one other that I have provided for them on the list. I want them to take note of what similarities these papers share. I will ask the entire class to share their discoveries and will lead them through the MGRP instructions. I will emphasize that this is probably a new way of working for most of them and encourage them to embrace the unknown. I will give the students roughly 5 minutes to brainstorm what concepts, ideas, and research questions they can glean from their reading of Anthem. Then I will write a list up on the board to hear what their interests are. I will group people according to their similar interests and let them get into those groups. I will ask them to pitch their idea and concept to each other and ask questions about each other’s topics. By next class, they are responsible for turning in a research topic proposal. It need only be a paragraph but explaining what their topic is and why it is of personal import to them. 40 min - Look at exemplar lit-based MGRPs online. Discuss their commonalities. I go over the requirements of the MGRP. Blackout Poetry is a new style of poetry writing and hopefully it will excite and convert the non-poetry enthusiasts in class. Blacking out published text feels so transgressive, but you can end up with really strong short poems. It is much harder than it looks. It teaches students about editing--getting rid of the unnecessary. During the introduction of MGRP using Count Basie’s bio and poem, I will note students who are contributing to the group discussion. I will also circulate during small groups pitching their MGRP concepts/ideas to each other. For students who visually learn, I have MGRP exemplars online, which they can take a good look at. Instead of having all the class just look at one exemplar, I ask the class to look at one (Dracula) and I let them class choose one other from the list. Choice is always a way to differentiate. I am also providing an audio and visual experience by sharing a youtube clip of Count Basie playing with a jazz band. Sharing this clip makes the music become real for the students who may not be familiar with his music and even the genre, jazz. Next time I will make a class set of the Basie encyclopedia entry and Basie poem instead of copying it for all my students. Next time I might have Anthem exemplars to share with the class. This is my first time teaching MGRP so I do not have any to share. Now that you have read Ayn Rand’s Anthem, here is your chance to have a conversation with Ayn Rand and her thinking. You will explore a research topic by creating artifacts in multiple genres. Organize all your paperwork in a binder or folder. If you create an artifact which you cannot put in the binder, leave a page in your binder explaining what it is and where it is available to view. Brainstorm what ideas, philosophies, and concepts in Anthem appeal to you most. This project is about your passion. What do you want to research? As you go through your research journey, enter your sources in Noodle Tools so you can create and organize your bibliography. Next, using your research sources, you will create 5-7 original artifacts. 3 artifacts must be in written form such as a narrative or play adaptation. 1 artifact must be performed or delivered orally such as a skit or the reading of a poem. This qualifies as oral interpretation. 1 artifact must be in visual form such as a sculpture or comic strip. Whatever you choose to be your artifact, remember to establish central tension. Looking back the 5-7 artifacts you have created, you should get a sense of unity in your MGRP. As readers and experiencers of your project, we want to move easily from one artifact and genre to the next. The repetend, the recurring word or phrase, will do this. Consider the theme that ties your artifacts together. For example, you can use quotations as the repetend to connect one artifact to the next. Some projects live outside text and use images, graphs, diagrams, song lyrics, quotations, or interesting facts as the repetend. Remember the repetend functions as a breather and a space to reflect. I want to see what your sources are in NoodleTools. Please list them in a bibliography. Follow MLA Form. To understand how you used your sources, in the annotations section of NoodleTools, briefly explain in a few sentences how you used your sources for your artifact creations. You can create your bibliography using NoodleTools and export it out. Please have a printed copy of your bibliography in your MGRP folder. As you near the end of your multigenre work, you will create a letter of introduction for your research project. We will workshop letter writing in class. In these letters, you will share with readers important things they ought to know before they begin reading your papers. Explain unifying theme, tone, symbolism. Contextualize your paper topic. You can tell the genesis of your paper or the importance of its subject matter to you. You might touch upon a key part of the story. Please turn in your MGRP. The fun part has finally arrived where we get to share our research and artifacts. Your final requirement is to present one of your artifacts as performance. It can be a reading of a poem to an acting out of a skit. The due dates for this will vary as we are splitting up the Symposium into sections. You will also be giving fellow students written feedback.